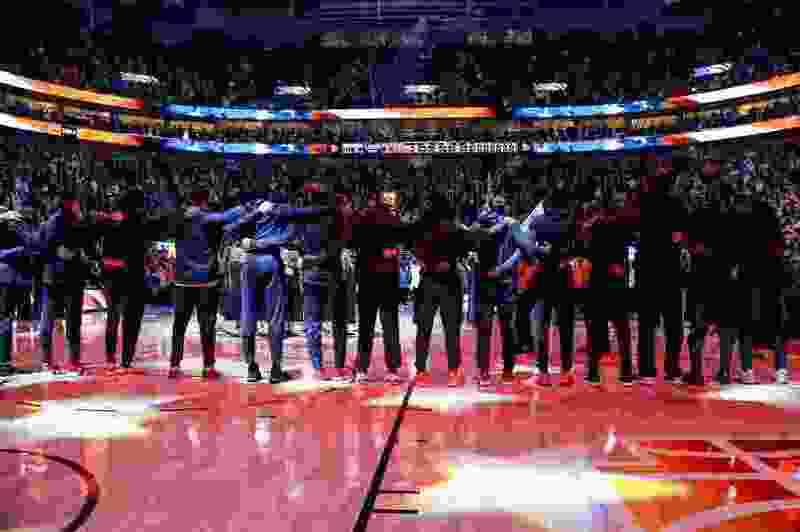 (Francisco Kjolseth | The Salt Lake Tribune) The Utah Jazz embrace for the national anthem prior to their game against the Sacramento Kings in the NBA game at Vivint Smart Home Arena Wed., Nov. 21, 2018, in Salt Lake City. “For me, it’s not really about the loss, it’s about the attitude that we’re playing with. Guys are hanging their heads. It’s not fun. We’re not competing at a high level. Even though we’re winning, it’s still not fun. I don’t see the joy in the game. Morris could have been describing the Jazz when he circled in on the joyful camaraderie. Multiple Jazz players have said their current group has more of that than any team they’ve ever been on. They like to spend time together, they eat together, they compete together. Their competitive conviviality is among the best in the NBA. But talent-wise, the Jazz are not the best. How far can brotherhood take a team? Is a lofty esprit de corps necessary to boost an outfit to its absolute pinnacle or to the top of the league? If you had to win, would you rather have more talent or more affinity and fellowship, cooperation and cheer? Look at some of the title teams of the past, and there are bunches of both sorts. Some of Michael Jordan’s championships were won with odd mixes of personalities. Detroit’s Bad Boy teams were hardly leaders in sweet-faced citizenship. Shaq and Kobe won rings even when they could barely stand the sight of one another. Fans, like parents of sometimes-quarreling children, want their pod to be tight-knit. They want players to be friends. They want them to root for each other. They want team chemistry to be what they blissfully hope and imagine it to be. Often, though, it isn’t, at least not as it pertains to real friendship. Team chemistry has more to do with timing, with properly spacing the floor, with setting screens, with passing the ball to the open man, with taking and making good shots, with rotating on defense, with hitting the offensive boards hard, with making the right play at the right time, with busting one’s tail. Nobody cares how friendly a teammate is at lunch or around the poker table or in the locker room or in the community if he doesn’t hustle back on defense and shoots the open 3 like Manute Bol. Nobody can play with joy if loose balls aren’t jumped on and pick-and-rolls are executed sloppily. The friendliest teams don’t regularly contend for championships. Like the coach said, the ones who have talent and toughness, fuel and fire, ability and anger, coordination and competitiveness, those are the ones to bet on. If all of that rolls into the kind of makeup that some refer to as chemistry, then it, as Rubio said, matters more than anything. It is what creates, to use Morris’ words, joy in the game. Best friends who are unselfish, but who will not fulfill their potential, who cannot do the things needed to compete at the highest level, those are the ones who find no happiness in the ball they play.